As I was pulling weeds on Sunday, it became clear to me, yet again, just how amazing these plants are. The drive to survive is truly remarkable! The tenacity to glue themselves to any surface. The ability to split off a tiny piece of root and keep growing. The level of drought and neglect they can tolerate. Well done. You have to admire them. After 2 weeks away, it quickly became clear where my last round of weeding had failed. Then again, who knows for sure. I think they work in waves, like an army. Some have fallen back, they are a little weakened. The new troops are fully rested, ready for battle. Until next season, it is hard to say if any territory has been reclaimed. 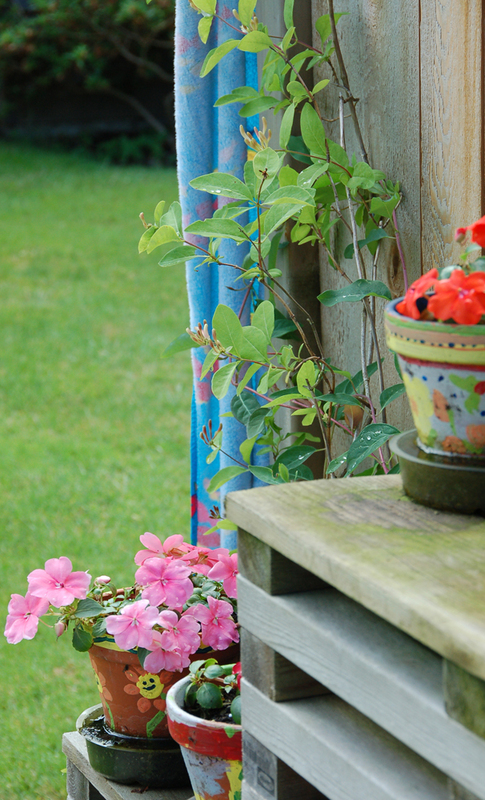 I was reading an article recently that equated negative thoughts to weeds. In other words, if you are not careful, the good stuff in your mind will become over run with nasty weeds. You are to be vigilant and pull those unwanted plants out by the roots, leaving your mind open to foster growth of the ideas you wanted there in the first place. Not a bad way to live. I don’t like weeds in my garden. 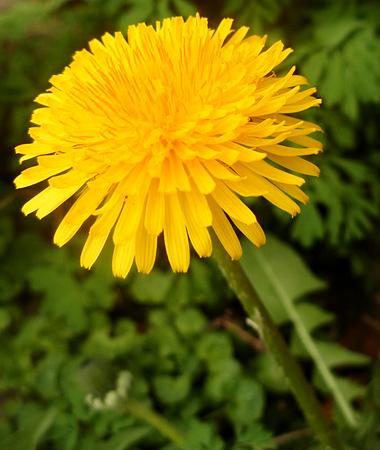 And no amount of creative salad making is going to make dandelions a welcome addition to the middle of my garden paths. I also, don’t want that kind of negative clutter rattling around in my brain. My days need to be clearly focused on what is good in this life. Period. 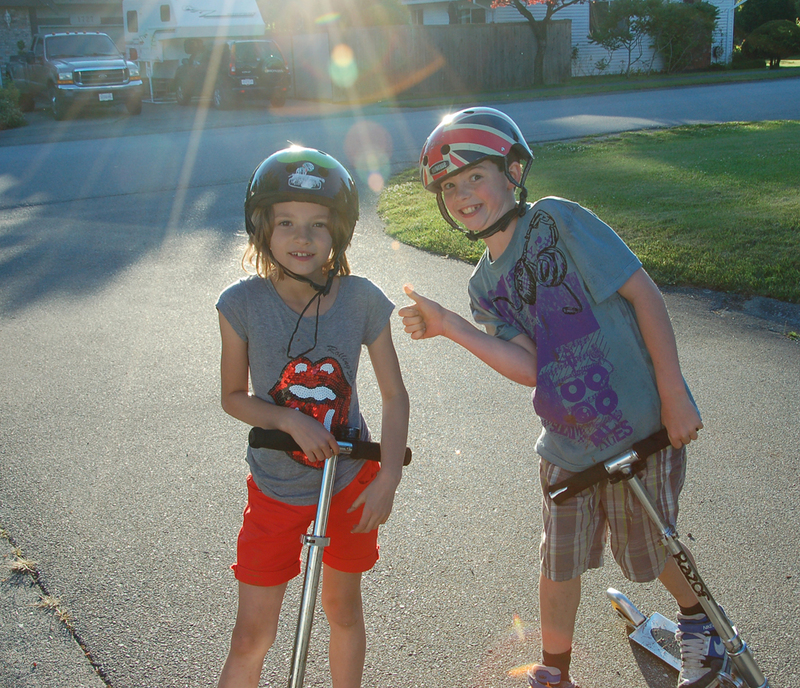 A sunny afternoon, 110 days before the summer solstice, sure seems better than the same conditions, 110 days after. There is promise in the air. The light is casting hope over everything in the garden. Green is growing new from the brown soil, rather than fading back into it. Today was a gift. The sun was shining first thing when I got up. The sky was blue and the wind was calm. Temperatures were very pleasant. I dressed for cooler weather and was rewarded with feeling a bit over heated as I weeded some of the front garden. 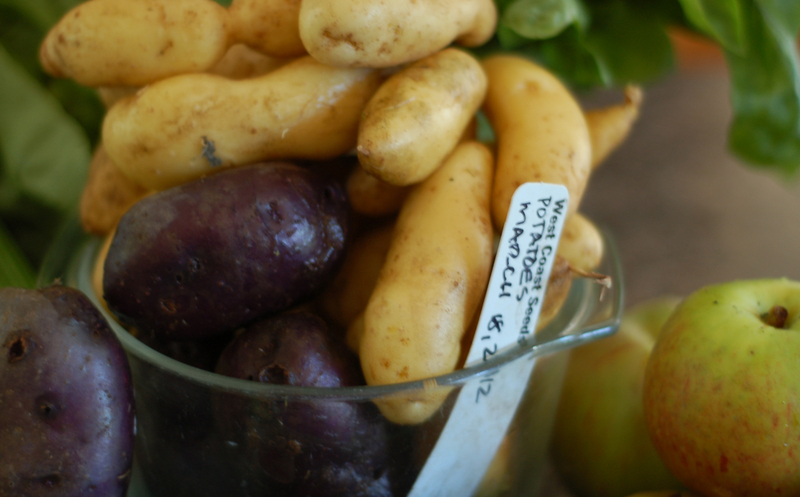 The ultimate treasure will be on our plates for dinner – a forgotten hill of fingerling potatoes. Enough fresh chives are up to make a tasty garnish. We don’t get many days like this, so early in the year, that I get to take advantage of. With only Saturdays and Sundays available, the saying usually goes, “What if the first day of sun after 2 days of rain?” Answer: “Monday”. Walking around the yard this afternoon, it is a welcome sight to see something that I planted and want to be growing, rather than just weeds. If there was a contest, I grow the BEST weeds around. Heather is always out early. 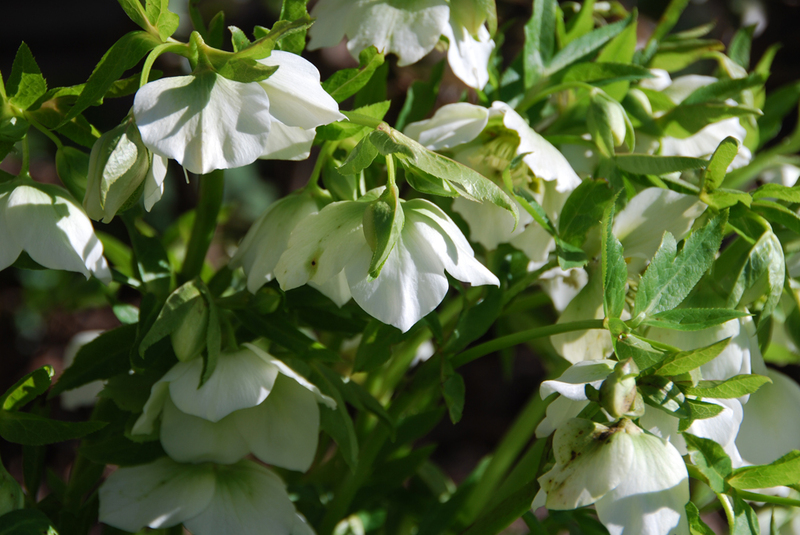 This low growing evergreen shrub will spread easily. Mine has to be dealt with this year. After 10 years, she is out of control. 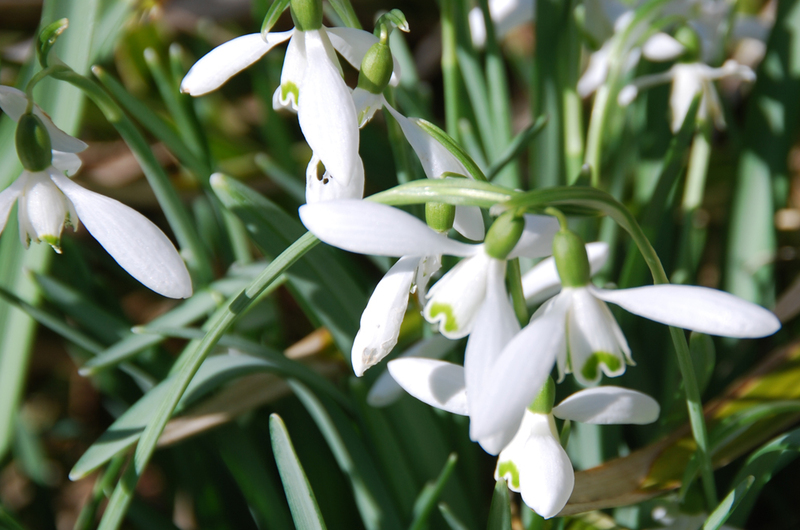 The snowdrops are of course a lovely first bulb. Easy to grow, multiply on their own without any help. Transplant so well, that I have never bought these. Got a gift one year from my mother in law and just keep letting them do their thing. 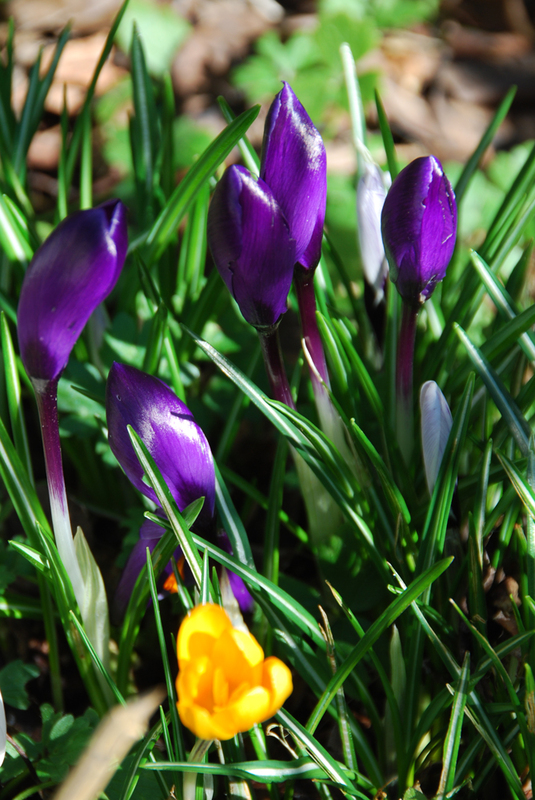 My Mom helped me plant these crocus bulbs when my baby girl was still to be contained in a bouncy seat. Her 10th birthday was last month, so it is time. This fall, I need to plant again and plan a bit better, where I want to see that colour, early in the Spring. It is such a welcome sight, I surely need 10 times as many as I have today. I think this perennial is called Bergenia. It was an expensive thing, bought many years ago, so the tag is long gone. It was the only flower blooming in February at the garden centre. So I had to have it. 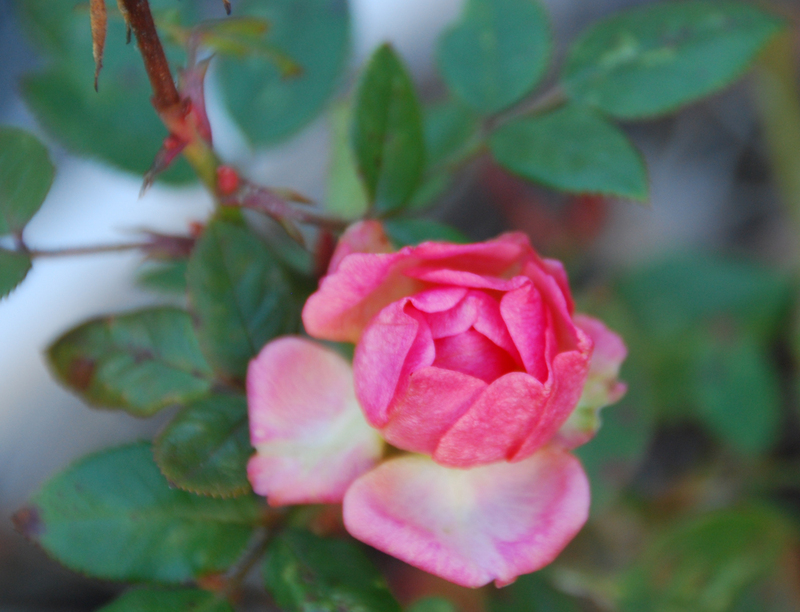 Finally, a little tea rose. She is a hardy soul that is hanging on from a bud formed last year. My husband went ahead and cleaned up for me this year. What a great guy! I worked all weekend at my day job and during a wonderful break in the rain, he put the whole garden to bed. I am super grateful for the help. But every gardener, even those whom share the same house and bed, have a different idea about how the property is best developed and maintained. My husband tends towards a minimalistic view. I like the rambling, move yourself around the plant, tending towards overgrown kind of garden. Since the days are so short, when I arrived home each evening, there was no way to know how “cleaned-up” the garden really was. I was warned by my man, “everything is tidy now,” he said. 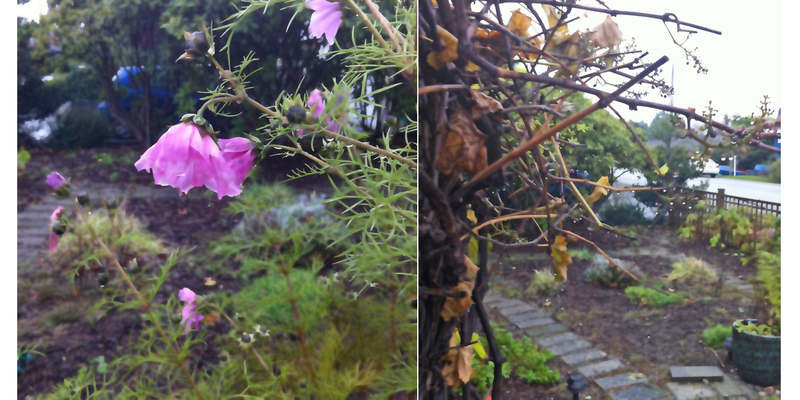 In a quick reprieve in the rain today, I ducked into the front yard to snap a couple of photo’s. 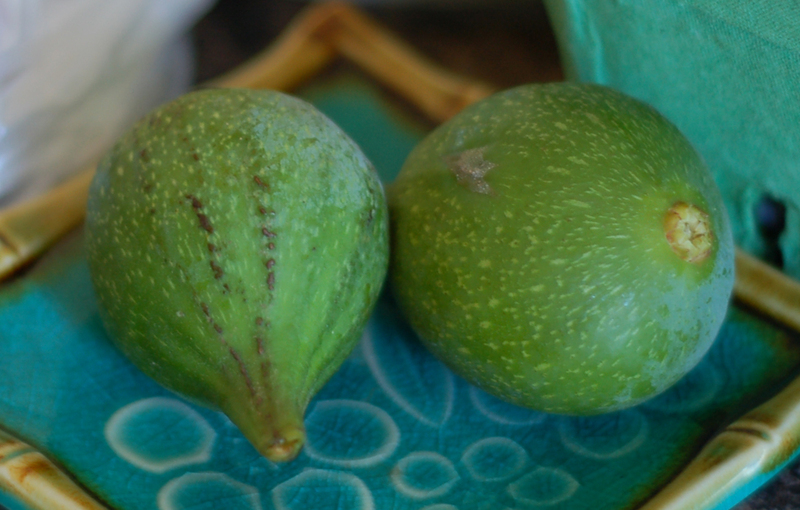 I won’t show you here, for I am too sad, but my fig tree is probably dead. I asked what reference he consulted when he decided to cut it back so hard? He said none. It has taken the better part of 10 years to get that tree to produce about 12 lovely figs each year. There is a plethora of tiny fruits that never get big and soft. I’m not sure what I am doing wrong. I would have never thought to cut it back like this. So we’ll see next summer if the tree survives and if it bears fruit. We’ll see. Sigh. But I do like how tidy everything else is. You just have to take it as it comes. That is the life of a gardener. Patience. First day of fall and I started my tomato harvest. 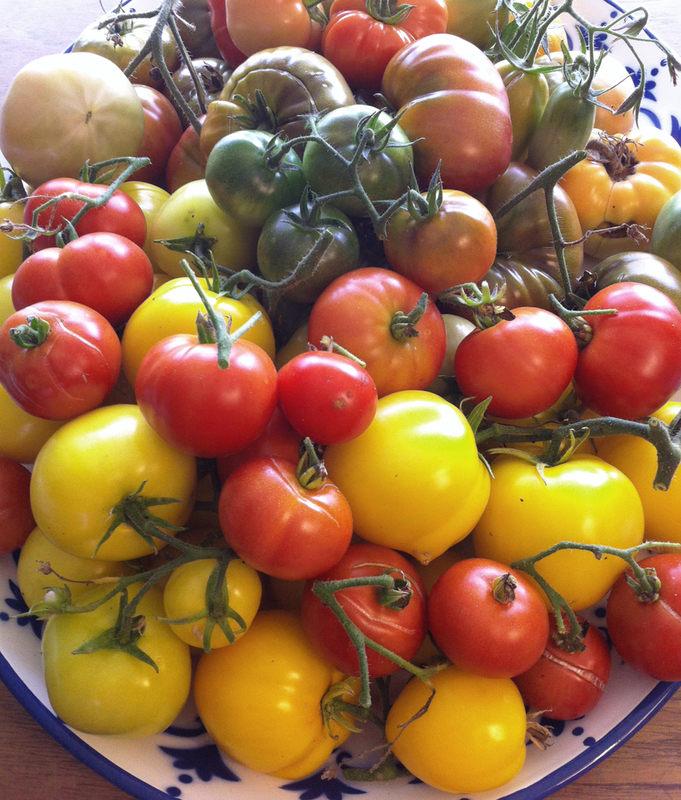 It was a complete joy to run around the garden to every plant and pick off the perfectly ripe and almost ripe tomatoes. A few green ones snuck in from the smaller bunches. Only 2 fruits were taken by insects before me. And the green tomatoes are everywhere still. If I am lucky, I have another 3 to 4 weeks before the rains come. I’ll be watching the weather carefully, with product boxes at the ready. When the time comes, everything will have to be picked. With any luck, we will have various types of fresh tomatoes through November. For today, there looks to be another 2 or 3 bags worth of apples that can be readied for pies. I’m already overflowing with applesauce and the kids don’t like my apple marmalade. Although, I may have to make some and give it away. To let the apples just fall and rot seems like a terrible waste. We had breakfast for dinner last night and with that meal hash browns made from my potatoes. While they can hold in the garden awhile longer, I already dug a bunch last weekend. They need to be washed and put in the fridge and eaten. So we’ll probably eat some version of potatoes all week. I may even go for a few soups where the potatoes provide the base. I think what made all these efforts in the garden so worth it was my daughter yesterday. She found a last strawberry, perfectly ripe. She picked it and ate it. She said it tasted so wonderful. That made me smile. And so it begins, or ends, depending on how you look at it. After all the hard work of planting, tending, weeding and watering the harvest begins to roll in. Thankfully, not all at once, for the work is not yet over. Now the washing, cooking and processing phase. From my garden, the figs, potatoes and apples. Just a few apples that fell to the ground, not great to look at, so I made a pie. As you can see from the quantity, I got a little carried away in my buying. This all has to be eaten as is or turned into something or otherwise put up for storage. Most of this cannot keep for long. This weekend will be busy. 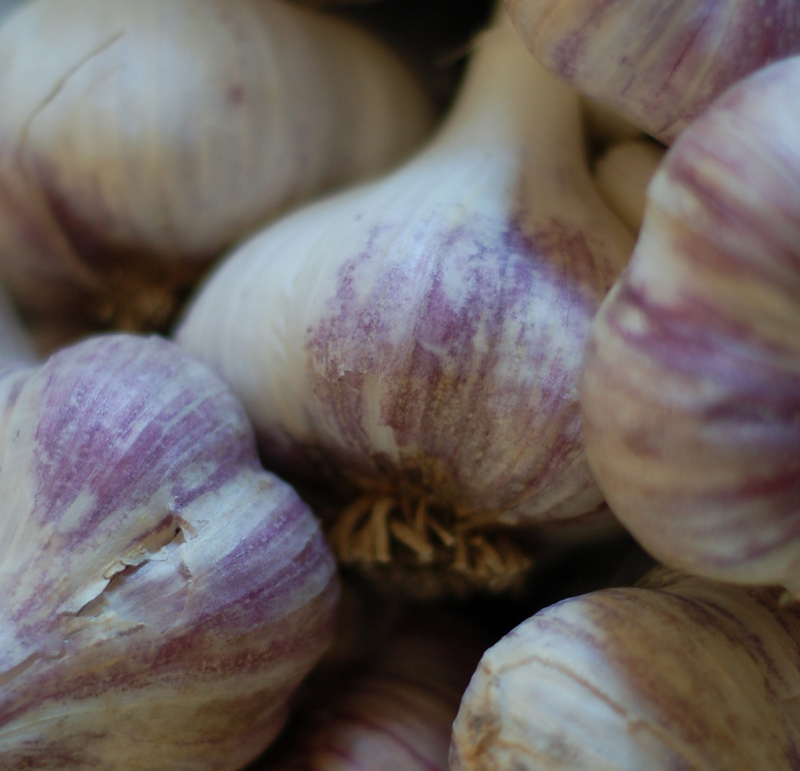 Garlic, how wonderful does this look? Compare that to the stuff that comes all the way from China! Back in March I planted these potatoes. Just the fingerlings. 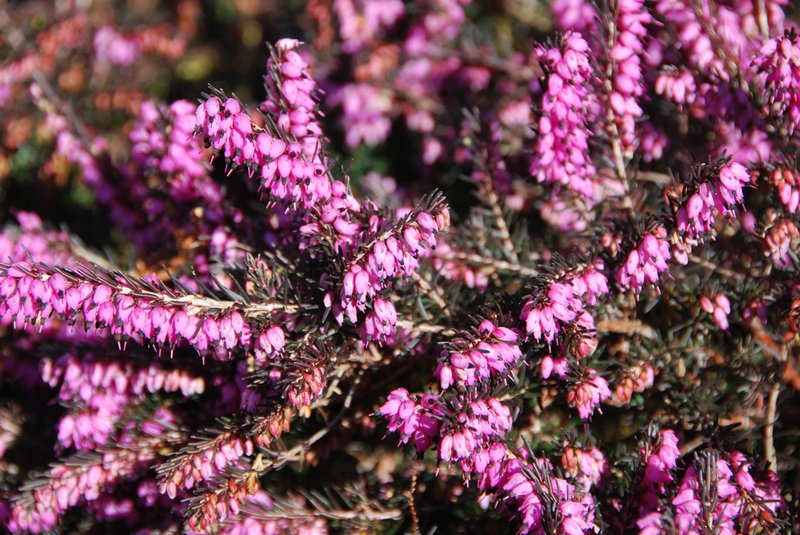 The purple ones produce seed and spread out further through the garden every year. My fig tree, started out as a baby, maybe 4 feet tall. Now she has spread out across the whole side of the house casting an impressive amount of shade with her floppy big leaves. The fruit is 2 inches across, massive in size when compared with commercially produced varieties. 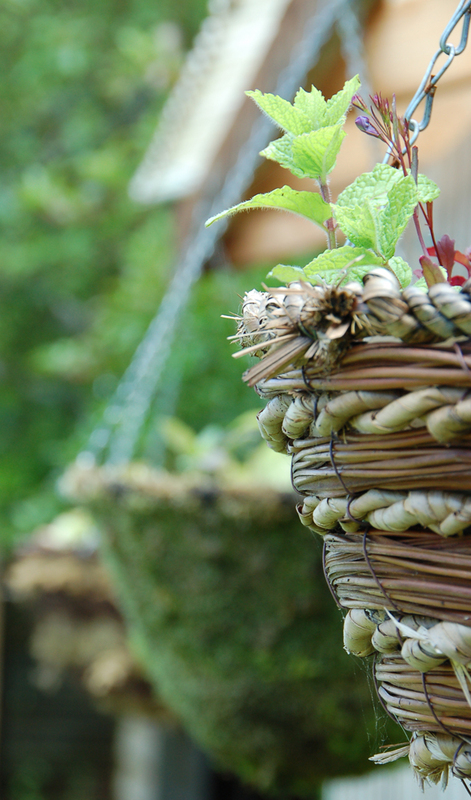 This is the best time of year to be a gardener and to live in a part of the world with a nice long season. The sun finally came out today. There had been a small glimpse of it yesterday, but then a rain storm came through that was very strong for this time of year. The temperature dropped about 12 degrees C and the wind did some damage. But today, it was warm enough to put on some sun screen. In anticipation of my photography e-course that starts tomorrow, I ran around taking some photo’s. And the light cooperated with my efforts. It was fun to get the creative juices going. Thinking about all the techniques that I sort of know like scale, proportion, depth of field, etc. 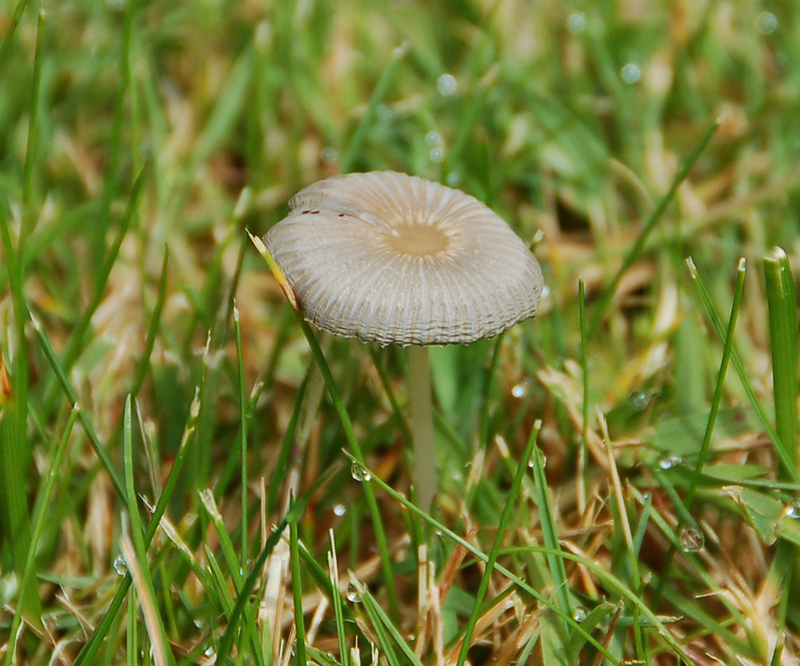 With all this rain, we have mushrooms growing in our grass. That is a common sight in December, but is very unusual in late June. Still, they are cute, I think. So many of the plants are taking over. This is our front walkway and you can’t walk there now. 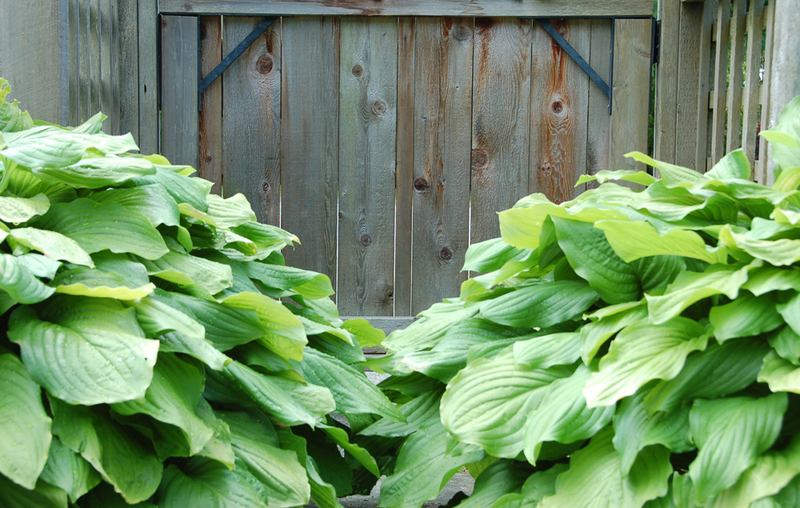 When those hosta leaves are wet, it makes your whole leg look like you stepped in the ocean. When I am walking around with a camera, I tend to notice very tiny things in the lens. 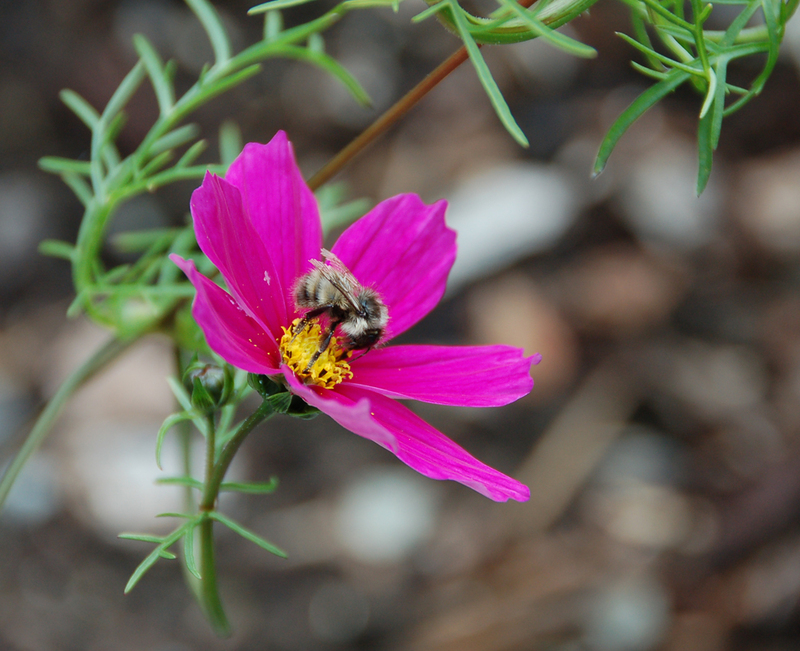 It was really great to see this bee and to get confirmation that it is a native honey bee no less. The beach towel hanging up on the end of the fence is from my daughters field trip to the beach this week. That was one fragrant towel, bringing home the smell of every, once living thing from this part of the Pacific Ocean. And around the corner from this fence is our hot tub. Once the lid was off, the chemicals were topped up, it was time to have a quick soak with a book. 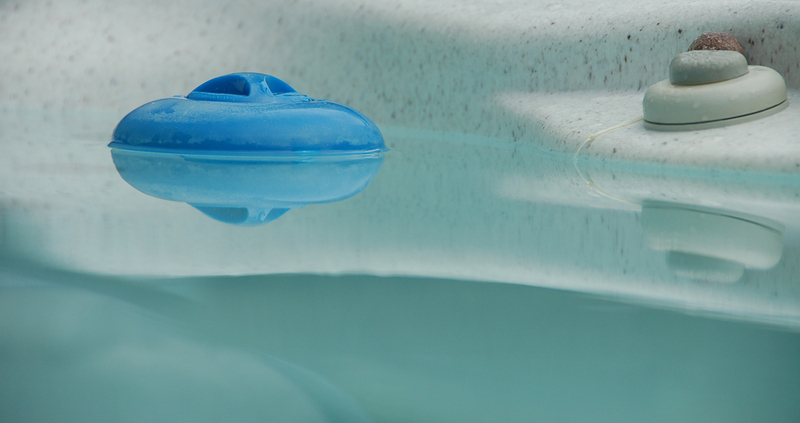 Our chlorine floater is anchored to the edge of the tub with a fishing weight. That way it doesn’t sink itself into the filter basket. The golden hour of the evening came. That brief period of time when you almost have to run around to get all the shots you might like to. Lucky I am not living off the produce from my garden. Not that I think you can actually live off a single harvest of anything like asparagus, anyway. Last count is 4 toothpick thin spears, that I don’t dare cut. The new asparagus patch has fallen to next years list of garden chores. 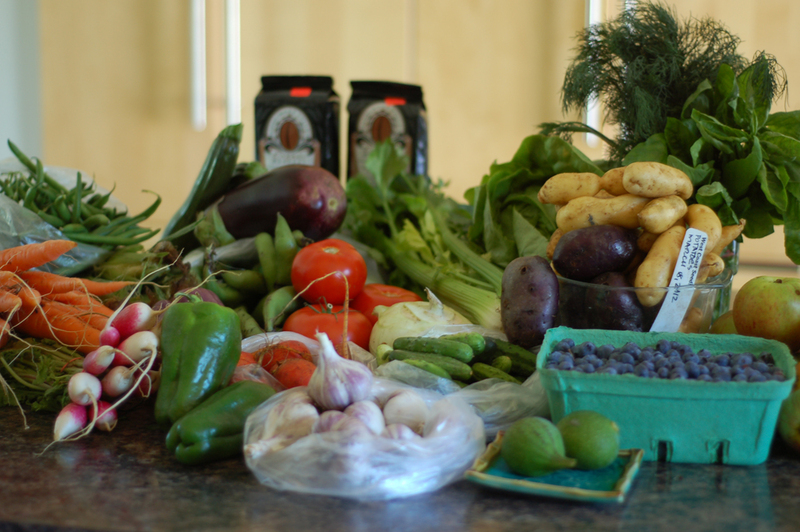 Lucky #2 is that we live in an area of great produce selection from local sources. 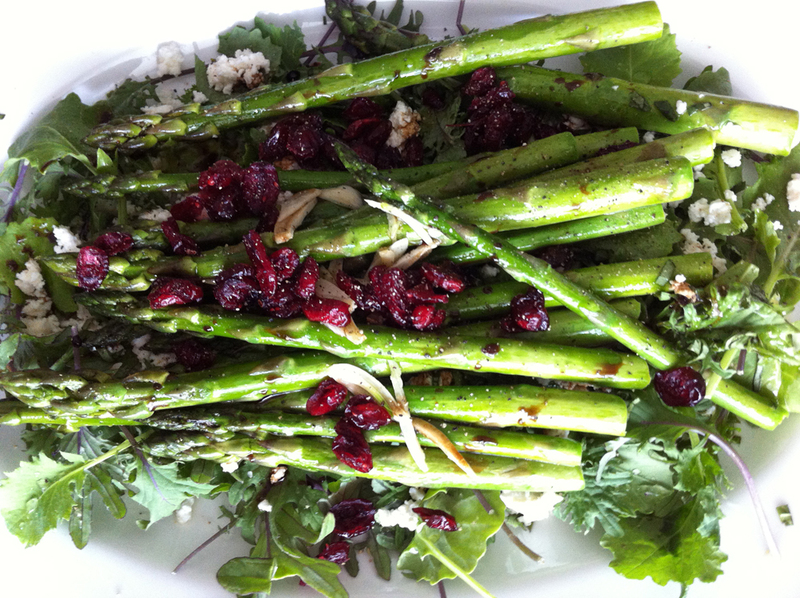 So I made this fantastic salad the other night from fresh asparagus and my home-made cheese. 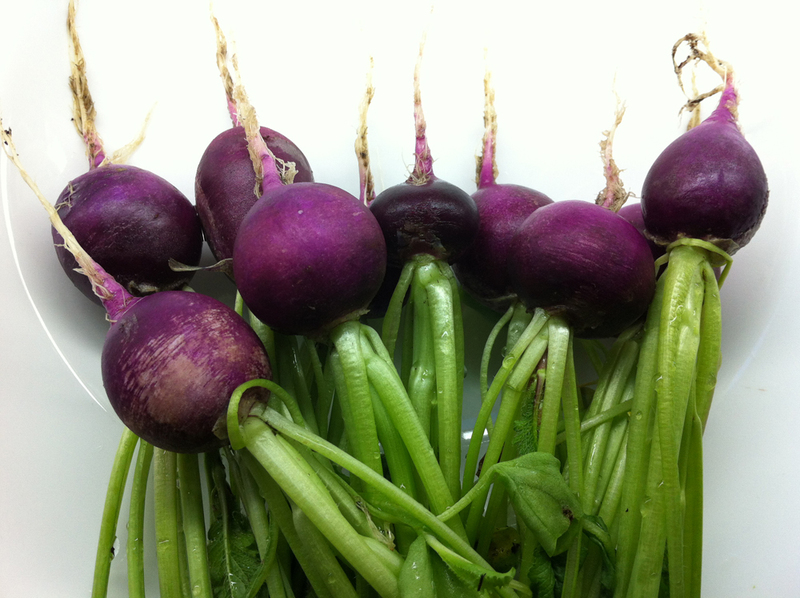 Lucky #3 is that I planted an early crop of radishes. April 1st the seeds for these babies went into hanging pots in my greenhouse. Tonight we enjoyed these at dinner. 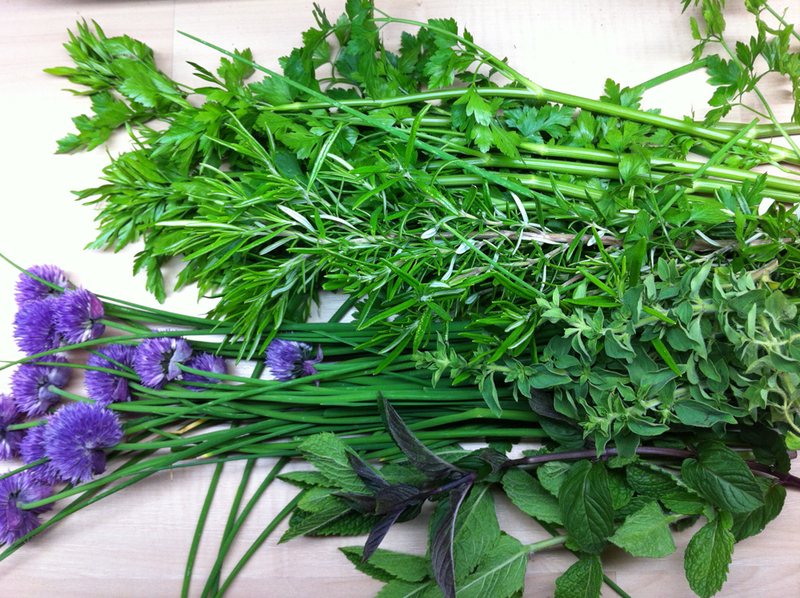 Lucky #4 is the fantastic supply of perennial herbs I have growing in my front yard. I felt like making a marinade for steak with lots of herbs, garlic and roasted chillies.